I was rather excited about taking a look at this ukulele for a couple of reasons. Say hello to the Southern Ukulele Store (SUS) All solid mahogany concert ukulele ACU-SUS. This uke represents the first step the famous store has made into having their own branded instruments - and that is one of the first things that excited me. I mean, I'm typing this as someone who likes to wear a SUS branded T Shirt, so what better than having an SUS branded ukulele too? In short summary, this is an all solid mahogany concert ukulele in a traditional design. Oh, and it costs £80.... That's right, £80, not £180. And there you have the second thing that excited me about it. An all solid mahogany concert uke for £80. That is an absolutely killer price. An all solid uke at the same price as the usual laminates such as the Lanikai LU21C. In fact, at the concert scale you have to go to £100 or so before you even see a solid top instrument, and in terms of an all solid instrument, you are going to have to top £150. As such, this price is quite stunning. 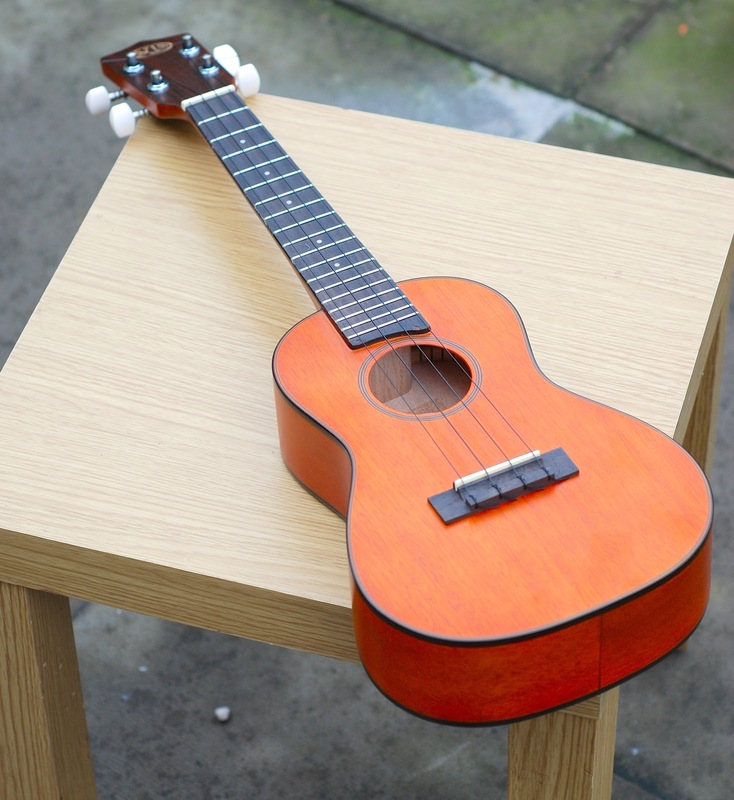 However, solid or not, it matters little if the ukulele doesn't play or sound any good, so how does it stand up? The SUS model uke is based on an Aria ACU-250 ukulele and has been re-badged to feature the SUS logo on the headstock and internal label. Speaking to the guys at the shop they told me they had been trialling a range of ukes to re-badge this way, and wanted to choose the model that really 'cut it' for them based on price and sound. The uke is traditional in shape, with a very classy double bout body made of solid mahogany. The wood used is not high end, so don't expect any curls or flaming in the grain, but it is simple, effective and nicely finished. The body of the uke almost glows with a warm orangey brown colour which to my eyes is very similar in look to the Islander range. The top is made from a single piece of wood, and despite being a budget model, benefits from some extra bling in the form of a soundhole rosette and edge binding in plain black. Both are finished very nicely, and whilst the rosette seems to be a transfer, it is under the finish and seems unlikely to rub off. That finish is in satin, and not over done in any way, giving the uke a classy look. The sides are in two pieces and also solid, with a simple joint at the base of the uke. The back is a single piece of solid mahogany, with a very slight arch to help with sound projection. Simple black binding between back and sides matches that on the top. It is all put together very nicely leaving a ukulele which is pretty standard looking but entirely respectable. The bridge is made from rosewood and is a tie bar design. It uses a plastic, uncompensated saddle which is to be expected at this price. A glance inside the uke also shows a very tidy build, with notched kerfling at the joints between top, back and sides. The label proudly displays the name 'Southern Ukulele Store' together with the model number (ACU-SUS) and serial number. All looking good so far. On to the neck - the wood type is unspecified, and it is made from three pieces with a joint at the heel and one towards the headstock. Again, this is expected at the price. The finish is nice and smooth and it has a quite chunky C shaped profile which I personally found very comfortable to hold. At the nut the width is on the narrower (standard) size. The fingerboard is laid on to the neck and is made from rosewood. It's a plain dark piece of wood with no light patches or stripes. I particularly like the shaping at the end of the fingerboard over the top of the body which sets it apart a little from other ukes. The edges of the fingerboard are unbound meaning that you can see the fret edges. There are also some ugly looking finish blemishes on the edge of the fingerboard. This is a shame, but SUS state honestly on their site that the uke may come with some blemishes, but the price and sound make up for them. These are, however, the only blemishes I found with this model so not too bad really. Frets are in nickel with 14 to the body and 18 in total. They are finished nicely with no sharp edges or uneven heights and are quite chunky too. Fret markers are in small mother of pearl inlays at the third, fifth, seventh, tenth and twelfth and look classy. Sadly, no side fret markers (how cheap are those to include....) so out with a Sharpie if you want those! Past the plastic nut and we have a standard crown shaped headstock, faced with a darker veneer and emblazoned with the SUS logo in gold. I think the logo looks great , and good to see it wasn't 'over done', or in a stark white transfer. It suits both the store and the uke. Tuning is provided by cheap, unbranded open geared tuners with white plastic buttons. They work just fine, but look far too big on the buttons for my liking. Still, they are the same sort of tuners you will find on most ukuleles at this price. Rounding off the package - the instrument comes strung with black GHS strings. More on those later, but..... ugh! So, a very nice price (a staggering price in fact), a simple but nice looking instrument, that despite one or two minor issues, seems to be put together nicely. How does it sound? First impressions were good, but sadly hampered by those GHS nylon strings which are not really my cup of tea. They are slippy and feel too low tension for my liking. I did persevere, but quickly found myself swapping out to flourocarbon strings. And, I am glad that I did. This ukulele has a surprisingly loud and rich voice for a small concert uke. Volume is great, and there is a real harmonic chime from the strings giving it quite a chunky complex sound when strummed. Note separation is decent, and it doesn't get too muddy. It is equally at home picked with some good sustain on show. As an £80 uke, it certainly surpasses many laminate sub £100 concert ukuleles I have played. It might not have as much bark as say, a Lanikai LU21 loaded with Aquilas, but that would be missing the point. The solid wood on this provides a more subtle ringing tonal quality that is missing on others at this price point. In fact I have played solid wood concert ukes for a lot more money than this, and this SUS model compares extremely favourably. The setup was only half decent on arrival. The saddle height was just as I would like it, but the nut slots were a little too high meaning some notes were going sharp at the low end frets. That was a five minute job for me to fix, but if you are a beginner, I would ask the store to look at those before they ship to you (or before you take it away). But those setup issues are not unheard of by any means at a price of £80, are easily fixed and not something that renders the instrument useless for all time. All in all, I think they have something of a killer instrument here for those looking to buy their first uke. Personally speaking, I think anyone in the store with intentions of buying a Stagg, Lanikai, Brunswick, Laka (etc etc!) laminate instrument for this sort of money should really be considering this as a very cheap step on to the solid wood ladder. In fact, for £80, it's worth a punt for anyone really. What's not to like for £80? Well, a couple of blemishes, a potential need for a setup tweak and those GHS strings. But they are minor issues for the money, and even if you buy one with flourocarbon strings fitted, you are talking only £86 for the ukulele. That is still a price miles below anything similar. Still not convinced? Heck, you get to play a uke with SUS on the headstock! Suspect the guys may shift a fair few of these at the Cheltenham Ukulele Festival this year. Hi! This is v.helpful. Thanks for the review. How do you think this uke will fare if re-strung with a low-G tuning? And what string set would you recommend? Don't see why not. Technically, any uke will. Not a fan of low G on concerts myself, but that's just me perhaps. Is there any advantage in buying this, rather than an Aria ACU-250 which are available for a lower price? 2. A lot of people like the SUS branding! But other than that - your choice of course. Hello again, I am sorry for the anonymous posting, I really need to get myself a proper account set up! I noticed Amazon wasn't sold by Amazon direct, but by a company selling through Amazon that does set them up - so I went for that. I am newish to the ukes so not yet into the branding side of things, but certainly I can see how if they're the company people go to, that would appeal. I ordered mine with a set of Aquila strings as that was suggested on the Amazon page and when the uke arrived it had been fitted with them, and the GHS strings were in the empty Aquila pack. So I can't comment on what the strings were like originally, but I think for what I paid this one has a nice tone and seems a bargain. Bought one of these as my first ukulele a few weeks ago. Got it from SUS and followed their advice to get it fitted from new with flourocarbon strings. It has a fantastic tone and seems pretty easy to play for a beginner. There are no obvious blemishes on mine but the fret ends are slightly rough which makes playing for a long time a little uncomfortable. My instrument has the SUS logo on the headstock but has an Aria ACU-SUS label inside which matches the info on the website which states that it is an Aria with geared tuners. Although I am a raw beginner on ukulele I have played a wide range of other instruments for over 50 years so feel able to make some assessment of the instrument and have been very impressed. The construction is basically sound with a good finish. Intonation is pretty good but does go seriously sharp on the lower frets - might try your suggestion to play with the nut slots? I recently decided to try low G tuning and swapped to an Aquila Red unwound for the G but kept the others as flourocarbon. The sound is wonderful - rich and complex, a complete change of character and much more to my taste as a contrast to the typical soprano sound. It came with a decent tuner and a gig bag for £85, was delivered next day with the replacement strings fitted. For someone who recently paid £2000 for a saxophone and sold a 10 year old flugel horn for £1800, this is unbelievable value! After a few weeks I decided I wanted to try different sizes of ukulele and bought a makala pineapple soprano for about £30. It came with vile sounding black strings but improved massively when I fitted some Aquila ones. Construction is basic but perfectly ok with good sound and pretty good intonation. Amazing for the price. To complete the set - for now anyway - I have just bought a Kala Tenor with cedar top and acacia body. It is similar to the all acacia one you reviewed with the same slotted headstock. After 48 hours, it still feels large and difficult to hold - think a strap might be on the menu - but the quality and sound are obvious. Not totally convinced by the Aquila strings and will certainly change to a low G but at £200 I am blown away by the sound and workmanship involved. The finish is faultless and the fingerboard feels so much better with the fret ends covered by a wooden capping strip. One of the tuners is misaligned by about 1mm -far less than on your model- but otherwise I can find nothing at all to criticise. Altogether a beautiful instrument which I just can't stop playing! Hi Mike. Re the notes going sharp - if that is happening at frets 1-3 then it is usually a case of the nut slots being high. Be careful taking them down though as it is a difficult job to reverse. Thanks Barry. My poor terminology I guess...... Not sure what lower frets mean to you. It goes sharp from about the 5th fret with the octave at the 12th fret almost a semitone sharp. A straight edge placed on the finger board does show that a couple of frets in the middle of the range are slightly higher than the others so I guess that this is not helping. Interestingly, the Makala pineapple at just £30 has almost perfect intonation all the way up to the 12th and final fret. Just got one of these ukes as a starter. The saddle on my one varies in height from one end to the other, 3mm one end, 1.5mm the other (above the bridge). Do I need to do something about this? This is my first uke, so a bit of a learning curve. Hi. I just had one of these delivered and noticed the same on the saddle, as a beginner don't know if this is normal or not? Just to add came fitted with Martin m600 strings as standard and free next day delivery, thank you SUS great service. Are these big enough problems to return it ? A saddle is often of different heights like this to compensate for the strings being of different thicknesses. To be honest it doesnt make a great deal of difference to accuracy on a ukulele of this scale and it wouldnt bother me. A saddle that moves however is NOT right. Personally I would take the strings off, remove it and ensure the base is sanded completely flat. If that is not something you want to attempt I would certainly call the store. Just bought myself one for Christmas as a step up from my Dolphin, yay. Looks fantastic, tuned it up and sounds great. Put it back in the box and have stored it away with the kids Ukes for Xmas..boo. Back to the Dolphin for now. I thought I would buy a concert for myself for Christmas (to go with my Brunswick soprano and Lanikai tenor). I only began to play back in January. I had decided on the Baton Rouge V2C but it is out of stock until January. Shall I go for this one or would I do better to wait? I like both of them Geoffrey ! Very similar! Hi Barry, Well, I bought the SUS and couldn’t be more thrilled! It is a beautiful thing. I enquired at SUS about what strings to fit and they told me that they had experimented to find what sounded best on this instrument and had decided it was D’darrio Nylgut which D’darrio had developed with Aquila. (I was thinking about trying Worth Clears). I went with SUS’s recommendation and have to say it sounds very nice indeed. Thank you for your hard work. Geoff. Mmm ok no video review posted in this. Still great to hear a good uke. Suspect not - this is a very old review!